Beth lives in the San Juan Mountains of Ouray County, Colorado where she leads writing and creativity workshops. Beth taught college writing for over twenty years at California State University Los Angeles. In her writing Beth tries to connect her close observations of the natural world to the questions of the human condition and spirit. In her words, "I try to keep my mind/ on this calling,/ the only way I know/ to save the earth." Beth's new collection of poems, Immensity, was published in 2016 by Kelsay Books/ Alrich Press. Beth's previously published books include The Truth about Thunder (2001), The Company of Trees (2004) and Wild Raspberries (2009), Canyon Notes (2012) as well as a collection of essays, Uniquely Ouray: Reflections of Life in a Mountain County (2007). 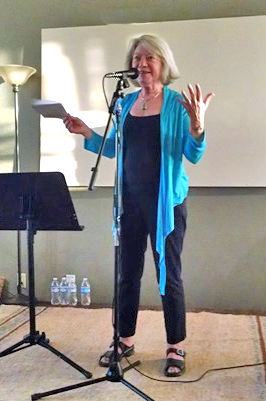 Her poems have been included in Crazy Woman Creek: Women Rewrite the American West (Houghton Mifflin, 2004) and What Wildness is This: Women Write about the Southwest (University of Texas Press, 2007). Two of her poems also appears in IMPROV: An Anthology of Colorado Poets (Green Fuse Press, 2008) and the anthology What's Nature Got To Do With Me? (October 2011) from Native West Press. One of her poems appears in Going Down Grand: Poems from the Canyon" 2015, Lithic Press. Beth has received several prizes for her poems, including a 2011 "Best of the Net" nomination for her poem, "Fragility." Beth was named a semi-finalist for the 2011 Janet McCabe Prize for her poem "And Then I Touched a Match to New-Laid Wood." Her poem, "Hollyhocks," was nominated for the 2007 Pushcart Prize and her poem, "The Color of Snow," was nominated for a 2009 Pushcart Prize. Beth's poem "Moon Directions" was awarded an Honorable Mention Prize by Passager magazine for their Summer 2010 issue. A second poem, "Chance," honored by Passager, appears in their 2013 issue. Her poem "Driving North" was nominated for a 2011 Pushcart Prize. Her poem Fragility was nominated for Best of the Net in 2011. Beth received third place in the 2012 Mark Fisher Prize contest for her poem, "Failte Eire." She received second prize in the Common Ground Review 2015 contest for her poem "Each Life Converges." She received third prize in the Naugatuck River Review's 2016 Narrative Poetry contest and a Pushcart Prize nomination for 2016 for her poem "Still Life with Oranges." Her poem, "In the Museum," received an Honorable Mention in Common Ground Review in 2018. Beth's poems have been published or are forthcoming in: The Climbing Art, Idaho Connections, Clark Street Review, Trestle Creek Review, Herb Network, Buffalo Bones, Mountain Gazette, Hard Row to Hoe, Sunstone, The Kerf, Welcome Home, Writing on the Edge, Tapestries, Mad Blood, Blueline, Shemom, Blind Man's Rainbow, Voicings from the High Country, Advocate, Sweet Annie and Sweet Pea Review, Red Owl, Tributaries, Aethlon, Ruah, Innisfree, The Oak, HeartLodge, Slow Trains, Pegasus, Terrain, Damselfly, The Lyric, Aurorean, Poetry of the Spirit, Still Crazy, Iris Magazine, Plainsongs, Red Rock Review, Poetry Saves, New Mexico Review of Poetry, Passager, Write On, Plain Spoke, Whirlwind Review, Wild Goose Review, Ruminate, Willow Creek Journal, Common Ground Review, Cloudbank, Imagination and Place, Willows Wept, The Eleventh Muse, Colorado Life Magazine, Riversongs, Pinyon, and Naugatuck River Review, Emrys Journal, Earth's Daughters, Dash, Lindenwood Review, Westview, Colorado Life, Ellipsis, The Progenitor, Trajectory, Front Range Review, Crosswinds, Glassworks, Off The Coast, Clover, Illuminations, Third Wednesday, Caesura, Leaping Clear, Main Street Rag and Slant.